With all the firepower that was lost from a year ago, offense was the big question coming into this season for Cretin-Derham Hall. Last season there were All-State candidates, 20-goal scorers and players cracking the 40 and 50-point barrier dotting the Raiders' lineup. Elite level players such as Bob Kinne, Colin O'Brien and Tony Barbato. In the Raiders 7-1 season-opening victory against Blake, it wasn't one of their established varsity players who got the offense in gear. It was Jack Stang, a junior who spent all of his time on the junior varsity last season, who scored goals 21 seconds apart and added an assist to conclude a three-point night in an impressive debut at the varsity level. "It's an unreal feeling," Stang said. "I've never really scored a ton of goals. I'm more of a setup guy. Just a great feeling to score a few goals." If Stang keeps producing a scoring touch like he unveiled against Blake, he might find himself as the setup man instead. "I'm just really proud of him," Raiders defenseman Dominic Nitti said. "To have a teammate who played his first varsity game and put up two goals is something to be happy about." 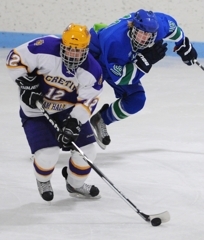 With Cretin already up 1-0, Stang took the puck from the neutral zone and raced to the slot. From there, he fired off a quick wrist shot that beat Bears goalie Devon Johnson on his glove side. Career varsity goal No. 2 came 21 seconds later on a slap shot from just inside the blue line, beating Johnson again on his glove side. "First one I just tried to get a shot and hope for a rebound," he said. "On the second one, just came across, puck was dropped to me and got it on net. "I have only witnessed goals scored that quickly in Bantams," he said. "I have never scored in that short of a time." 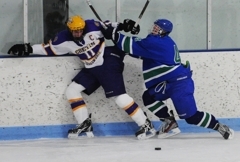 With a crops of big, strong defensemen, Cretin-Derham Hall coach Jim O'Neill was too worried about his defensive zone in the Raiders' season opener. If there were any concerns in regard to scoring, some may have been answered against Blake. "We knew coming in we had good defensemen and our goalie is good," O'Neill said. "We just didn't know who was going to score for us. It is good to have a guy like Jack (Stang) come up like that for us, as well as some other guys that scored their first varsity goals. "Some of our defense like to get up in the play and get involved in the offense like Dominic (Nitti), but to have some of our other forwards come up big was important for us." 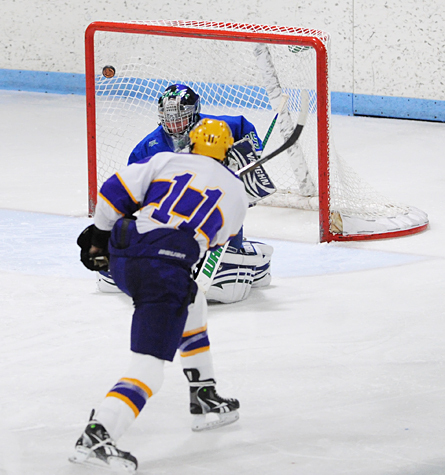 After the first 17 minutes of play, Cretin-Derham Hall had a 4-0 lead and had outshot Blake 15-1. As one-sided as it was, the Raiders could not take a chance and sleep on the Bears. Even with the lead, Cretin-Derham Hall stayed aggressiveand was able to take care of business in pretty much every facet. "They took it to us," Blake coach Jon Sturgis said. "That first period was pretty disappointing and some of that might be on the coaches, but you have to give Cretin credit because they just beat us." In the second, after a small parade to the penalty box was done for the Raiders, they went back to play aggressive all over the ice. "There is a lot of offensive talent on that team, so you can't give them a chance to make it a close game," Nitti said. "That's a team that can come back on you, so we made sure we kept going after them." 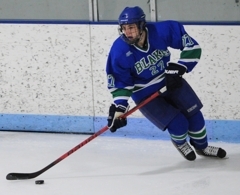 Thomas Blease did get Blake on the board when he found himself all alone in the slot, where he was able to find the puck and the back of the net for Bears' lone goal. "We got that one and we had a five-on-three for a little bit that I thought, if we could get one in, we could get something going," Sturgis said. "In the end, we didn't and a large part of that is because of what Cretin did to us." 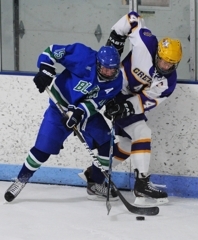 Other than the Blease goal, Blake had a hard time getting its offense going as Cretin-Derham Hall maintained a lot of pressure, which forced the Bears to make quick decisions and led to turnovers. "There was still a lot of hockey left to be played, and we scored four goals in the first, there is no reason why they couldn't do it to us," O'Neill said. "I think we let up a little in the second and we talked about that and came out and had a much better third." "We wanted to finish the game out and keep pounding them," Stang said. "Play for 51 minutes and get the job done. We just tried to come out flying and put pucks on the net." 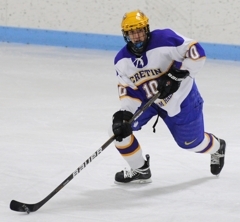 Jack Stang scored goals 21 seconds apart in his first varsity game to help give Cretin-Derham Hall a 7-1 season-opening win over Blake at Highland Arena on Tuesday, Nov. 29. 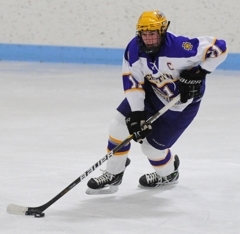 Cretin-Derham Hall opened the first period with four goals and outshot the Bears 15-1. Dominic Nitti opened the scoring for the Raiders midway through the first. Stang followed with two of his own to open the game up for Cretin. With less than 2 minutes to go in the first, Kendal Bolen-Porter scored and gave the Raiders a commanding lead heading into the locker room. Bears forward Thomas Blease was able to grab a loose puck in the slot and get a wrist shot past Raiders goalie Marc Petrykowski, who faced nine shots. Luke Dietsch, Frank Hoffman and Joey Decker all scored in the third to cap the scoring. 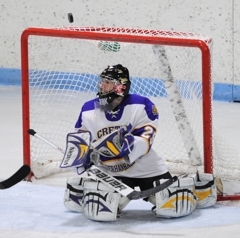 Cretin-Derham hall finished with 27 shots and Bears goalie Devon Johnson had 22 saves. Along with his two goals, Stang had an assist. Nitti also had three points, on a goal and two assists. 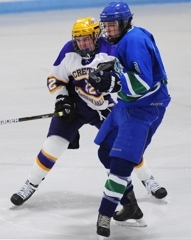 Cretin-Derham Hall travels to White Bear Lake on Saturday its first Suburban East Conference test. 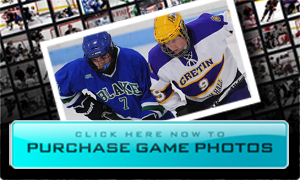 Blake falls to 2-1-0 and will travel to Crookston and Thief River Falls on Friday and Saturday. 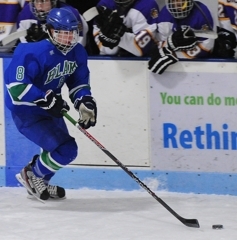 In his first varsity game, Stang scored two goals and recorded an assist. 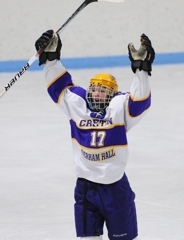 His two goals helped Cretin build a lead it would not come close to surrendering in its convincing win against Blake. 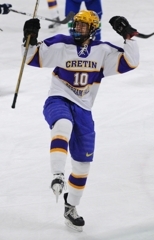 Stang's goals were goal-scorer goals, even though he considers himself to be a playmaker. Nitti comes in as the Raiders top point producer from a year ago and the defenseman showed no signs of early season rust or jitters. He also recorded a three-point game, a goal and two assists. 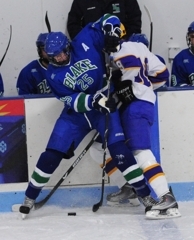 Nitti also used his big frame to his advantage, taking away space and the puck from Blake. His goal got the Raiders on the board in the first, what ended up turning out to be a productive first 17 minutes. McMahon does not get a star for what he did on the stats sheet, but for how he kept Blake's firepower off it. Considered one of the reliable returning seniors, McMahon was solid on defense and hit a post from the point in the first period, which if it went in, would have been the first goal of the game. He kept Blake at bay and was one of the reasons why goalie Marc Petrykowski only faced nine shots.